Although it’s technically still winter, spring is definitely on its way here in Chicago! The next three days will be in the sixties and there are plenty of spring showers in the forecast. I can’t wait for green grass, leaves, and flowers to return! This weekend we can turn the clocks forward an hour and enjoy some extra sunlight each day. So much to look forward to! One thing I’ll miss as we bid farewell to winter is all the delicious, hearty comfort food we’ve been devouring over the past few months. Don’t get me wrong, there are some wonderful tradeoffs and no one’s going to stop me if I really want to make a big ‘ole batch of chili in the middle of July. Still, I’m looking forward to trading hot soup for a bowl of refreshing cold tomato soup, roasted potatoes for fresh pasta salad. As I mentioned in last week’s post for Chicken Wild Rice Soup, I wanted to share this new chili recipe we tried recently before spring arrives. So, here it is! 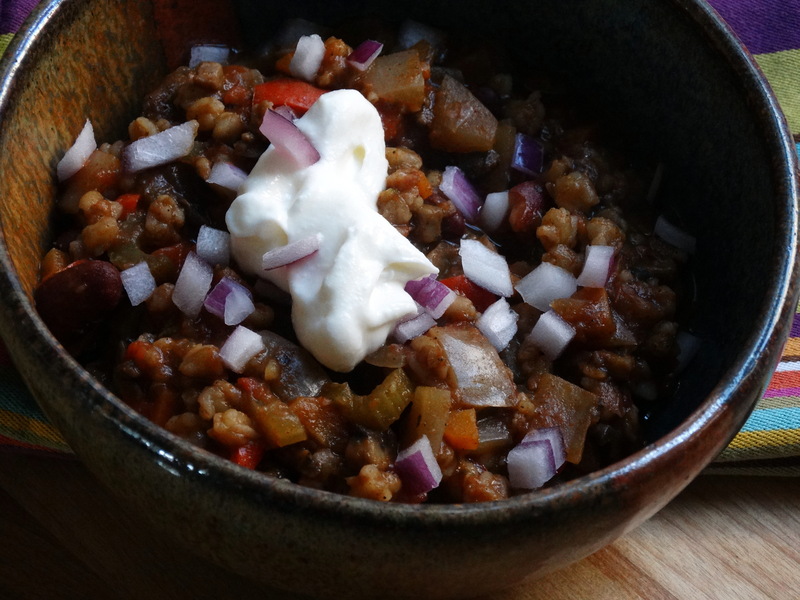 I love how the wheat berries and mushrooms give this vegetarian chili a wonderful meaty texture. You will need olive oil, yellow onion, a bell pepper, celery, carrot, a jalapeño pepper, cremini mushrooms, garlic, tomato paste, chili powder, cumin, dried oregano, smoked paprika, cayenne pepper, stewed tomatoes, water, tomato sauce, wheat berries, a can of beer, liquid aminos, kidney beans, red onion, and sour cream. 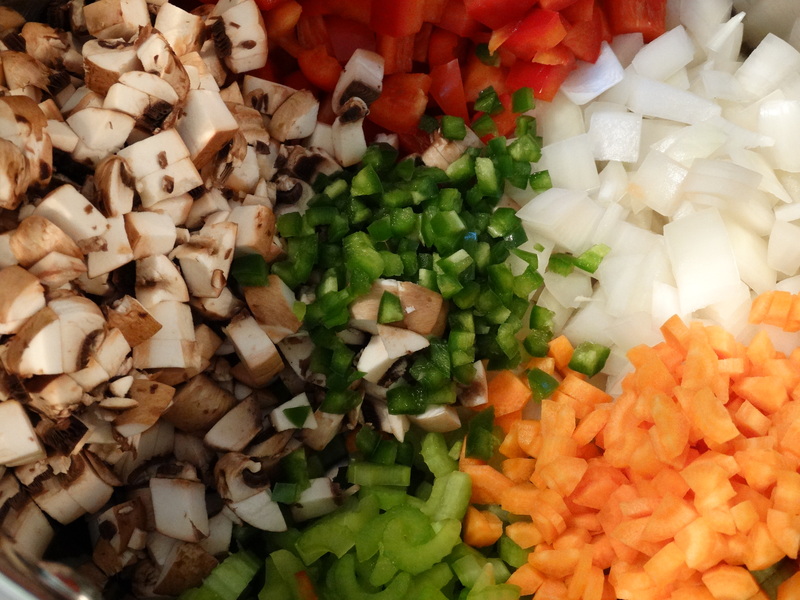 Begin by washing and chopping your vegetables: 2 cups yellow onion, 1 cup red bell pepper, 1/2 cup diced celery, 1/2 cup diced peeled carrot, 1 tablespoon finely diced jalapeño pepper, and 1/2 pound diced cremini (also known as baby bella) mushrooms. Peel and mince 5 garlic cloves. Heat a large stock pot at medium with 2 tablespoons olive oil. 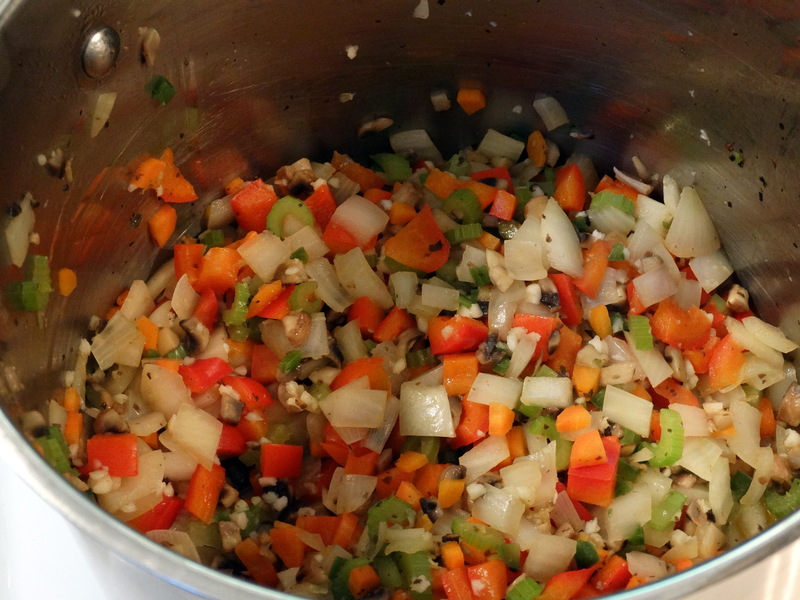 When hot, add your vegetables and sauté for about 10 minutes, or until most of the liquid evaporates. Next add 3 tablespoons tomato paste, 1-1/2 tablespoons chili powder, 2 teaspoons ground cumin, 1 teaspoon dried oregano, 1/2 teaspoon smoked paprika, and 1/4 teaspoon cayenne pepper. Cook for 3 minutes, stirring constantly. Add one 14.5 ounce can stewed tomatoes with their juices, 2 cups water, and 1 cup tomato sauce to your pot. If the tomatoes are whole, use your hands or kitchen scissors to reduce to smaller pieces before adding them. Bring to a boil, then reduce to a simmer and cook for 30 minutes. While the chili is simmering, add 1/2 cup uncooked wheat berries and 3/4 cup water to a small sauce pan. Bring to a boil, reduce heat, and simmer for about 15 minutes or until the water is absorbed. Remove the cooked wheat berries from heat and set aside. After your chili has simmered 30 minutes, add the wheat berries, 1 cup of your favorite beer, 2 tablespoons liquid aminos (such as Braggs*), and one 14.5 ounce can drained and rinsed kidney beans to your stock pot, then simmer an additional 20 minutes. *If you don’t have liquid aminos, you can substitute soy sauce (reduced sodium preferred). Serve it up hot with your favorite toppings. I recommend diced red onion and sour cream. Enjoy! 1) Begin by washing and chopping your vegetables: 2 cups yellow onion, 1 cup red bell pepper, 1/2 cup diced celery, 1/2 cup diced peeled carrot, 1 tablespoon finely diced jalapeño pepper, and 1/2 pound diced cremini (also known as baby bella) mushrooms. Peel and mince 5 garlic cloves. 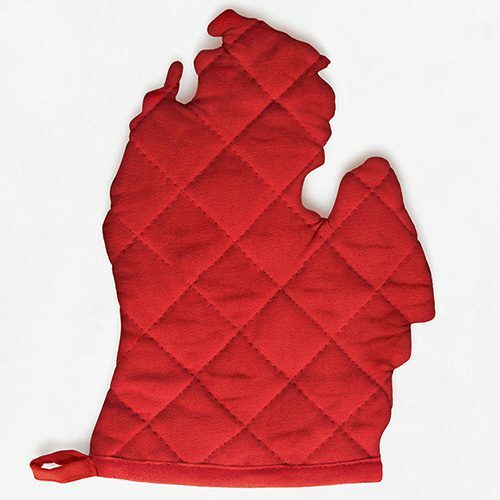 Heat a large stock pot over medium with 2 tablespoons olive oil. 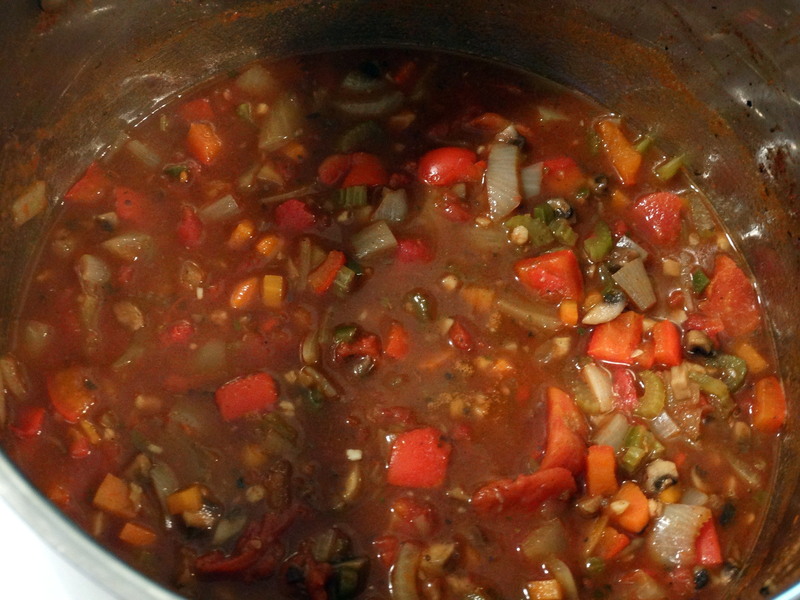 When hot, add your vegetables and sauté for about 10 minutes, or until most of the liquid evaporates. 2) Next add 3 tablespoons tomato paste, 1-1/2 tablespoons chili powder, 2 teaspoons ground cumin, 1 teaspoon dried oregano, 1/2 teaspoon smoked paprika, and 1/4 teaspoon cayenne pepper. Cook for 3 minutes, stirring constantly. Add one 14.5 ounce can stewed tomatoes with their juices, 2 cups water, and 1 cup tomato sauce to your pot. If the tomatoes are whole, use your hands or kitchen scissors to reduce to smaller pieces before adding them. Bring to a boil, then reduce to a simmer and cook for 30 minutes. 3) While the chili is simmering, add 1/2 cup uncooked wheat berries and 3/4 cup water to a small sauce pan. 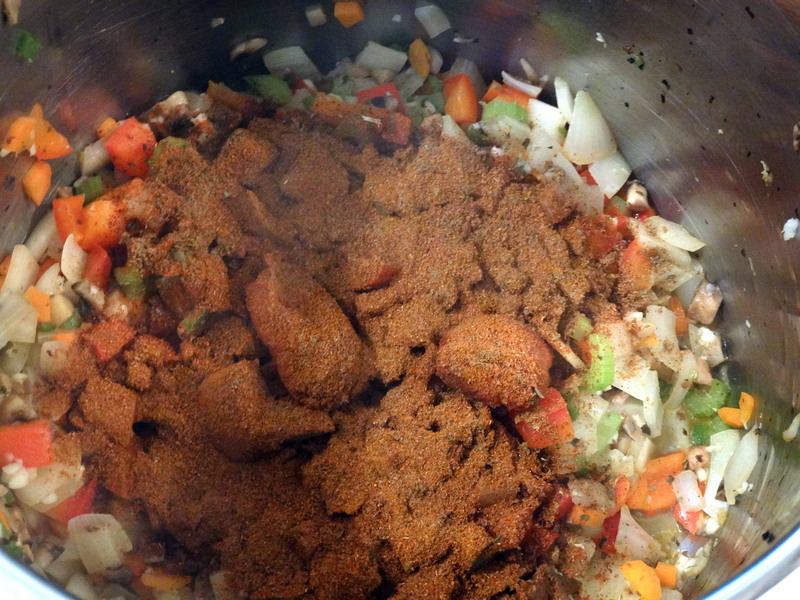 Bring to a boil, reduce heat, and simmer for about 15 minutes or until the water is absorbed. 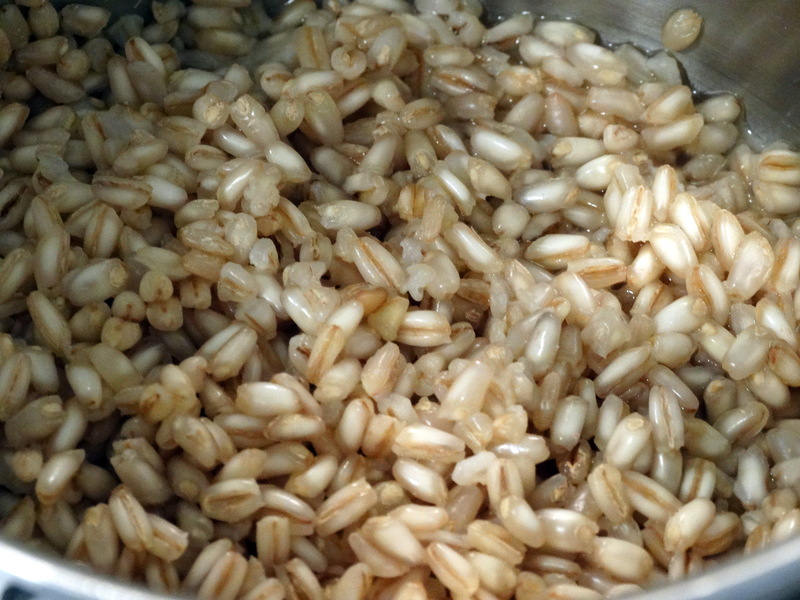 Remove the cooked wheat berries from heat and set aside. 4) After your chili has simmered 30 minutes, add the wheat berries, 1 cup of your favorite beer, 2 tablespoons liquid aminos, and one 14.5 ounce can drained and rinsed kidney beans to your stock pot, then simmer an additional 20 minutes. Serve immediately with your favorite toppings and enjoy!